NOTE: 2018 work on this project is compete as of November 18, 2018. There will be a section of cable guard that will be installed next year, and polymer overlays will take place on the bridge decks for US 41/US 141 over Riverside Drive, County B, and the CN Railroad. Note: For information regarding the US 41/US 141 and County B Interchange Reconstruction Project in Brown County, please view the interchange project webpage here. Resurfacing and bridge repair will take place on US 41/US 141 from County M to Norfield Road in Brown County. Note: A separate US 41/US 141 & County B interchange reconstruction project will take place within the resurfacing project construction limits. Both projects are shown on the map. The pavement surface of this portion of US 41/US 141 is beyond its useful service life and is in need of resurfacing. Many structures along this portion of US 41/US 141 are also in need of deck repair or replacement. Safety enhancements are also needed as traffic volumes have increased throughout the years. Cable guard is a type of roadside or median safety traffic barrier/guard rail. It consists of steel wire ropes mounted on weak posts. Its primary purpose is to prevent a vehicle from leaving the traveled way, crossing the median, and colliding with cross traffic. Cable barriers function by capturing and/or redirecting the errant vehicle. The crossover construction is to maintain 2 lanes of travel while working on bridge decks. 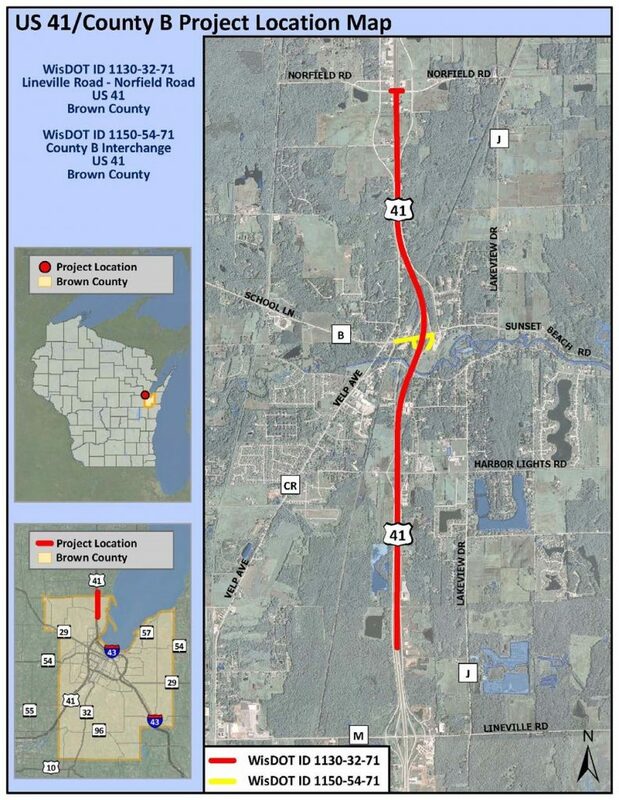 Traffic in one direction will “crossover” to the other side of US 41 to create a 3-1 split-traffic configuration. Traffic will switch to the 3:1 configuration on Wednesday, May 23 and remain in place the remainder of the project. November 16, 2018: Work complete for 2018. Spring of 2019: There will be a section of cable guard that will be installed. Polymer overlays will take place on the bridge decks for US 41/US 141 over Riverside Drive, County B, and the CN Railroad. * These are tentative dates and subject to change. Motorists will encounter a southbound US-41 long-term lane closure, off-peak lane closures, short-term (overnight) full closures for bridge demolition, and temporary crossovers during construction. Please expect some delays, especially during peak-travel time such as morning and evening rush hour or special events. No lane closures will take place during Packer gameday travel periods. Southbound US 41 will be reduced to one lane from County B to Norfield Road. Expect travel delays during peak travel times. Southbound US 41 motorists using this location for travel are encouraged to seek alternate routes. Both lanes of northbound US 41 will be maintained during peak-travel times. Off-peak lane closures will be allowed on northbound US 41 (see days/times below). May 23 to end of project: Temporary crossovers and temporary lane widening will allow two lanes of traffic to be maintained in both northbound and southbound directions for the remainder of the project. Two lanes in each direction will be maintained during northbound US 41 bridge work using a 3:1 highway lane configuration with crossover traffic (one lane open in the northbound direction, and three lanes open in the southbound direction, with one lane of opposing traffic crossing over and using one of the three lanes). Off-peak lane closures will be allowed (see days/times below). Rolling closures are full closures of very brief duration (20 minutes or less) where a state patrol officer slows down traffic while work crews close the lane for equipment relocation. A full closures of northbound or southbound lanes may occur up to 5 nights (total) for bridge demolition. A signed detour will be in place on US 41/US 141. (NOTE: This bridge demolition has been completed and this closure alert if for reference only). Monday night, May 7 through Thursday night, May 10. Harbor Lights Road between W. Deerfield Lane and E. Deerfield Lane in the village of Suamico, Brown County, will be CLOSED Tuesday, March 20 through November 2018 for bridge deck rehabilitation.